So where do Habits of Mind fit into the picture of learnable intelligence and the acquisition of excellence? Well, the story fits together something like this: In order to achieve excellence you must believe that intelligence is not a fixed thing – that failure is not a measure of having reached your potential, but rather it is a challenge to be overcome – and that CAN be overcome. Carol Dweck refers to this as a Growth Mind Set. To grow, and become successful by reaching our goals we must engage in Deliberate Practice. This was described by Anders Ericsson and popularized by Daniel Coyle. Deliberate Practice is different from simple rehearsal in that it pushes us outside our comfort zone into what’s been termed the “Goldilocks Zone”. This is the area where we are confronting challenges that are neither too hard, nor too easy, but rather are on the very edge of our ability. The above represents the key elements on the path to success, but doesn’t describe how we become competent at walking that path. In order to walk this path successfully we must develop our ability to confront these types of challenges. In the Goldilocks Zone you are confronted with problems, the solutions to which are not immediately apparent. This is the very definition of the type of situation where successful people skillfully and mindfully apply their Habits of Mind. Without well-developed Habits of Mind the challenges that are posed by working in the Goldilocks Zone can’t be met successfully. Without developing our Habits of Mind we may appear to have reached our “potential”, or in other ways we create a “greatness gap” between ourselves and expert performers as a way to explain our apparent under performance. Increasingly difficult challenges require increasingly effective Habits of Mind to overcome them. So in order to grow, we must not only confront challenges, but also develop our ability to overcome these challenges. We must continually develop our Habits of Mind. To develop our Habits of Mind requires its own deliberate practice, coaching and reflection. Just as we must focus on our progress towards our goal, we must also focus on the development of our ability to make that progress. Steven Covey would refer to this as a focus on our production capability over simple production – learning how to do better, rather than simply doing. This is the HOW of achieving excellence that has been largely over-looked by the research to date. This is the continuous growth of the Habits of Mind. 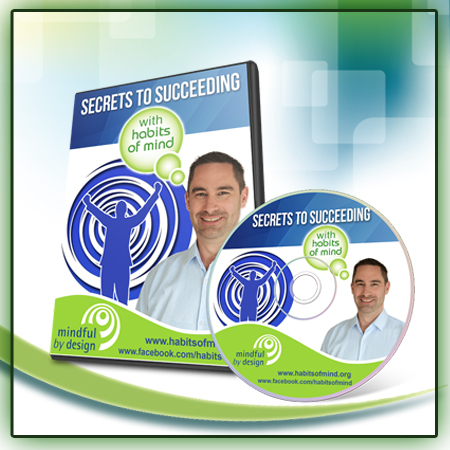 The Habits of Mind have been the missing piece of the puzzle to achieving success. Not only do we need to focus on our goals, but also on continually developing the Habits of Mind that enable us to successfully confront the increasingly difficult challenges posed as we make this journey.